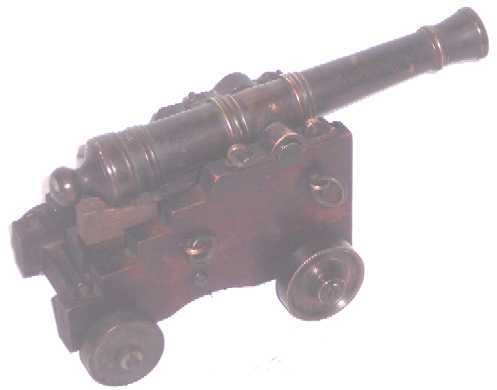 Presented here, a finely detailed and constructed model cannon. Beautifully turned 9" bronze barrel. Touch hole and bore connect making this a working model. Carriage is mahogany. All parts of metal are bronze. Circa, early 1800's. Model working cannons have become very scarce in the market place today. Overall dimensions are 10" long x 4-34"wide x5" high. Condition is excellent.